Serving Arlington, Alexandria, Sterling, Manassas, Woodbridge, Springfield, Leesburg, McLean, Burke, Great Falls, Fairfax VA, and many more. Are you tired of cleaning out your home’s rain gutters or paying money to have someone do it for you every year? Have you experienced gutter damage and roof ice dams from big snowfalls and cold winters? Gutter Helmet by Harry Helmet® is Northern Virginia’s certified dealer and installer of Gutter Helmet®, the #1 gutter guard system in America with over 65 million feet installed. 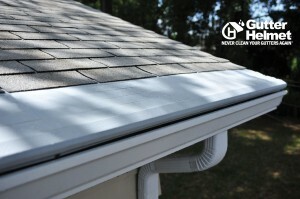 Gutter Helmet® keeps pesky debris out of your gutters and guarantees that they will never clog again! 100% Guaranteed. Gutter Helmet® also reinforces your gutters to increase load-bearing capacity, protecting your gutters from heavy snow and ice. For over 34 years we have installed thousands of Northern Virginia gutter and Gutter Helmet® systems. We are the trusted choice for gutter projects in Virginia. We’re located just over the border in Maryland, but routinely service communities and cities throughout Northern Virginia. Contact us today at 1-888-5-HELMET. Serving Northern Virginia communities, including Leesburg, Arlington, Manassas and many more.